We are delighted to be back with another edition of Whom Pods Destroy. In this episode we discuss the early Season 1 episode of Star Trek The Original Series called Dagger of the Mind. 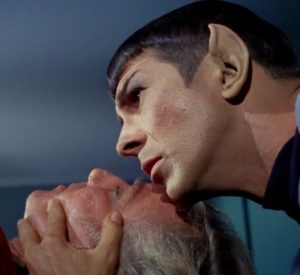 We see for the first time the Vulcan mind meld in this episode. Dagger of the Mind also resonates today with its themes on abuse of power, misplaced trust and issues regarding our penal systems. There is also some stonking trivia relating to one of the show’s guest stars, Marianna Hill.